So im trying to make some rokkits but i cant seem to make the rounded part. I have plenty of tube to make the rest of the body but i just dont have a reliable way to make it. Does anyone know how to make at least a good tip? I tried takeing some sprue and gluing it together then running it through a pencil sharpener. I have also tried putting the sprue in a dremel and then running it on sandpaper also. Any ideas? 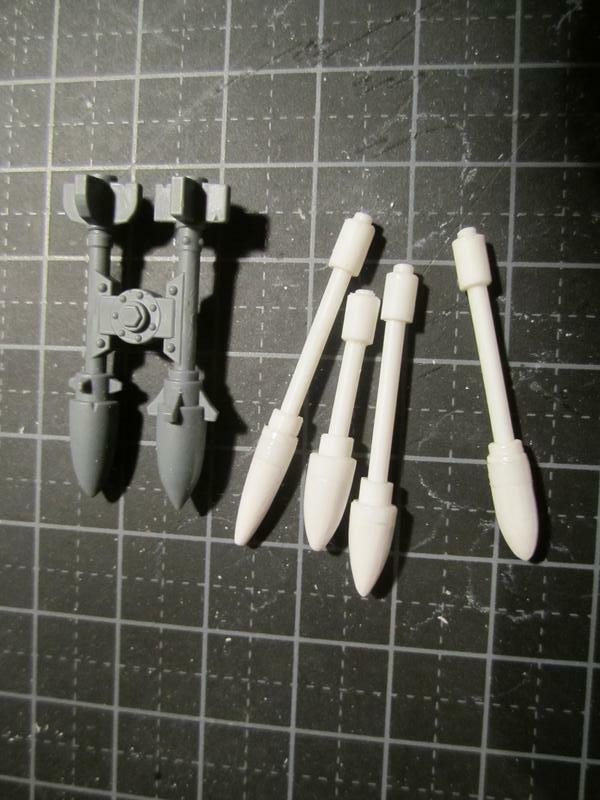 For my tankbusta's rokkit the tips are the tips from bic pens. I have also tried putting the sprue in a dremel and then running it on sandpaper also. I'm assuming it didn't work? Try using emery cloth/paper - you can usually buy packs of various grades from tool shops and some Cash&Carry type shops, use a course grade (low 'grit' number) first and then go up the numbers 'til you get a finish you're happy with. Don't blame Yourself for dremel idea not working. Don't forget plastic melts under friction. You may try taking piece of copper wire (bend it in "?" shape) , then covering it with some sort of putty (GS probably wouldn't work, try something like Milliput or plumbing putties). I used putty for turning (that's teknikul term) pistons, big bullets/rockets, ball (for sockets) and even some of my brass sculpting tool ends. Also some sand papers (especially fine ones) work best when You wet them (so called wet sandpapers), that may help. I would say take a plasticard rod and put four trapezoid like shapes on each side then top it off with a ball of greenstuff to make the tip. Best results I've had is with Lite Brite Rokkits. You can find lite brite pegs on ebay if you don't have them already in your home. Note that it's a good idea to rough them up with sandpaper so that paint and glue adhere. You can see the technique applied here and here. Good luck and keep us posted on the results! You can see how I did it in my mek thread about the tankbustas. Very easy. Take the burna boyz arm an the burna. Clip off the end of the barrel and use the rokkits from a dredd or a flyer or whatever, then just take the lead that should be going back behind the boy to his gas tank (which now isn't there) and invert it so it's leading to the base of the rokkit. You can get the rokkits on ebay for cheap if you use the ones from various of our vehicle packs and you probably have enough burnas and arms kicking about if you run lootas. Oh my God! He wants to be a ballerina? That's MY f*#%ing dream! Take a piece of sprue to a pencil sharpener. The tip is plasticard rod on sandpaper. Hold the rod with two fingers and rotate it against the sand paper. Quite simple and easy. Once the tip is finished saw it off and glue to the rest of the rokkit which is also built from plasticard rods and pipes. Make sure you buy pipes with same diameter as the rods so they fit together nicely. I'm working on a full unit of Tankbustas right now (and I don't like the GW models), so I've been scrounging rokkit launchers and building my own using Burna arms and rokkits from every conceivable source, including a couple of 2nd edition hunter killer missiles. With some judicious cutting and shaping, I was able to get 2 rokkits out of each hk missile. Step one, grab a rock. Step two, make an Ork believe it is a rokkit. Now you have a rokkit. Greenstuff works as well. Just put a glob at the end of your tube, wet your fingers and roll the tube while lightly pinching the greenstuff. They don't have to be a uniform size, of course. Because Orks.